Having a greenhouse is a much-appreciated luxury. To avoid being profligate, I eke all that I can from its every square inch in every season. For starters, it’s a cool greenhouse — temperature-wise “cool,” not “ain’t this a cool greenhouse” cool. Winter temperatures are permitted inside drop to 35°F. before the propane heater kicks on. And in summer, roll-up sidewalls let in plenty of cooler, outside air to save energy (and noise) in running the cooling fan. Demands on the cooling fan are also minimized by letting summer temperatures reach almost 100°F. before the fan awakens. I have to choose my plants carefully for them to tolerate such conditions. 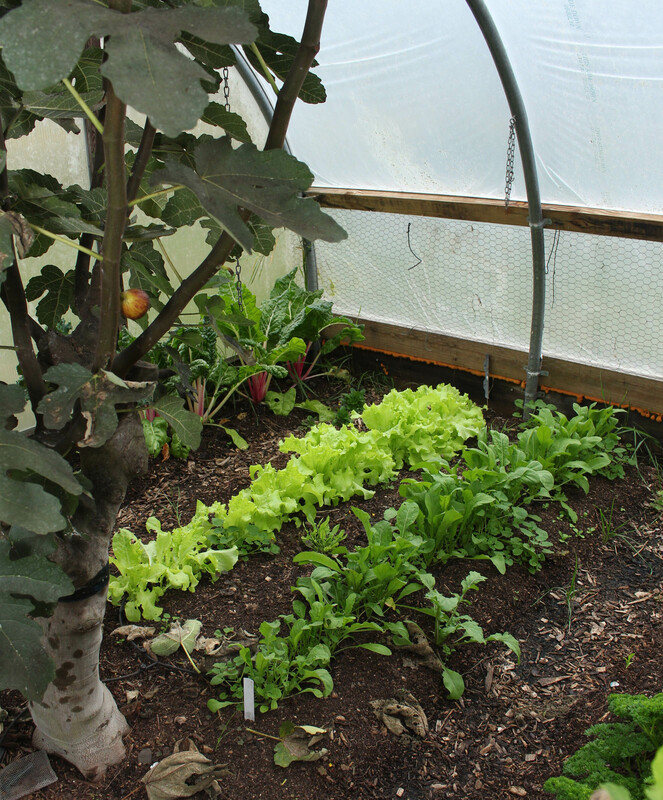 Right now, lettuce, arugula, mâche, celery, parsley, kale, and Swiss chard seedlings and small transplants trace green lines up and down ground beds in the greenhouse. I sowed seed of most of these cold-loving vegetables about a month ago. They’re too small to harvest now. No matter: The outdoor vegetable garden is still replete with greenery available for harvest through November and, probably, on into December. By then, greenhouse greenery will have grown to harvest size, then continue to do so very slowly through the dark, cold days. And the 100° summers in the greenhouse? Above the beds spread the branches of three large fig trees, planted right into the ground (rather than pots). From those branches dangle ripe and ripening figs, as they have since July. Figs originated in the searing heat of summers in Western Asia; they can take the 100° heat of my greenhouse. Soon, cooler temperatures and lowering sun will drive the trees to stop ripening fruits, and lose their leaves and enter dormancy. (Figs are subtropical, rather than tropical, trees, so enjoy a cool — but not frigid — winter rest.) The few, leafless branches, most of them pruned back, will cast little shade to let the cool weather greenery in the ground beds below bask in what little sunlight fall and winter have to offer. Starting in February, my greenhouse does triple duty, becoming also a home for transplants for the upcoming season’s vegetable and flower gardens. 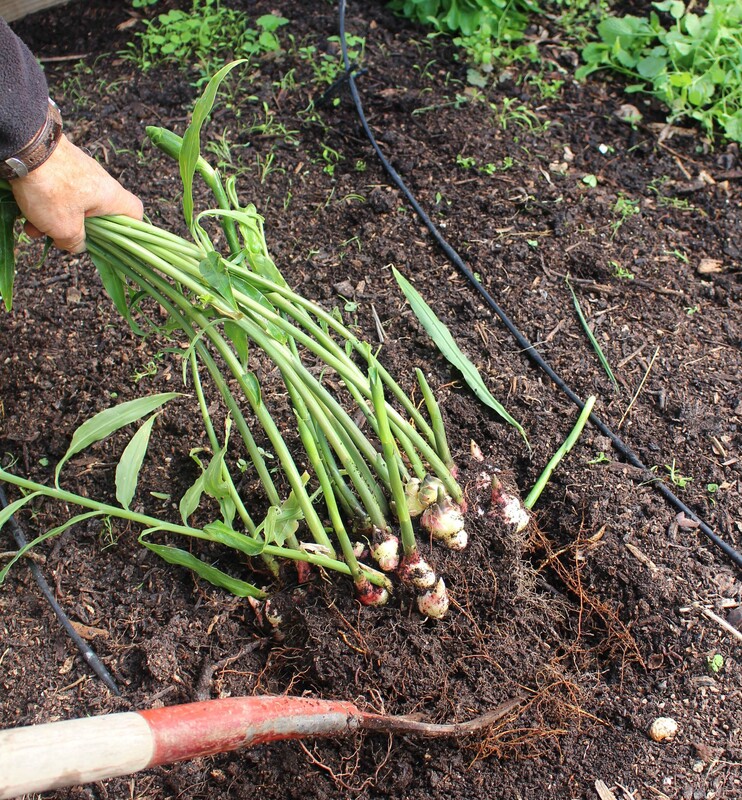 I plant the first seeds — onions, lettuce, celery, and leek — in early February, sowing them in seed flats on the narrow bench along the greenhouse’s north wall. As each spring morphs into summer in the greenhouse, fig growth begins anew and winter’s cool weather vegetables wane and are cleared away. How about putting the ground beds beneath the awakening fig trees to some good use? In the past, I’ve tried growing melons and cucumbers, all of which originated in hot regions of Africa and Asia, in those beds. Neither the melons nor the cucumbers did particularly well — yet. Which brings us to this week’s ginger harvest. Greenhouse beds this summer provide a warm, moist home in which to grow ginger, a plant indigenous to the hot, muggy climate of south China. Ginger would be hardly worth growing if all I wanted was the khaki-skinned rhizomes that I could pick off a supermarket shelf. Those tough-hided roots are mature ginger, which has a fibrous flesh. What I was shooting for was baby ginger, whose pink-tinged, white skin, encloses flesh that is tender, lily-white, and free of fibre. The flavor is a little different than mature ginger, cleaner. This tropical plant I figured could — and it did — thrive in my hot greenhouse all summer. To get started, way back in March, I purchased a single root of mature ginger at the supermarket, broke it into four sections, and potted each section into a 4 inch pot. As I said, the plant needs heat, so I set the pots on my seed-starting mat to maintain a temperature of about 70°F. Still, it took awhile for green sprouts to show. The potted ginger plants were ready to plant out in a greenhouse bed just as the last of winter’s vegetables were being cleared away there. After planting, I refurbished the soil with a mulch of compost. Cool soil got the plants off to a slow start but once summer heat kicked in outdoors, and then really kicked in within the greenhouse, the ginger thrived. The goal was to let ginger linger to eke maximum yield but not so long that the rhizome would begin to mature. I also needed space for this winter’s plantings. As it turns out, the first objective, maximum yield, was moot. Yields were prodigious, four plants yielding much more than we could possibly eat. 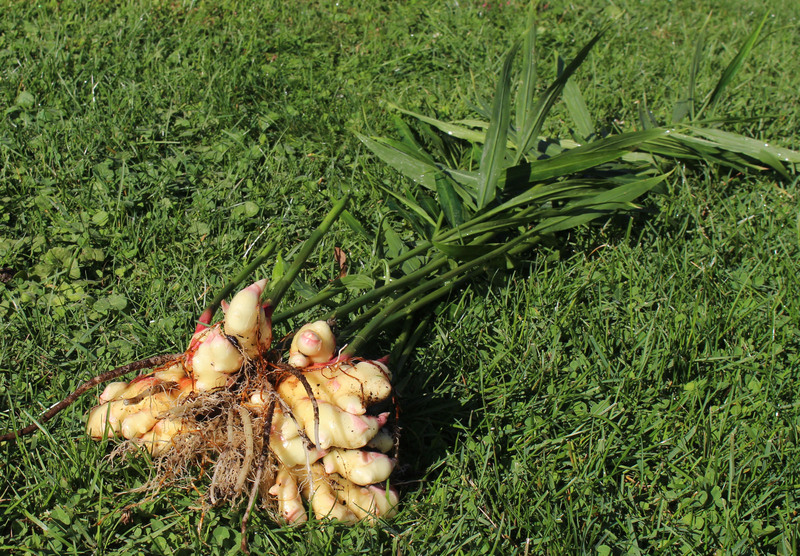 The first order of business with the harvested baby ginger was to pickle it. All that was needed was to slice it thinly with a carrot peeler then pour boiling vinegar sweetened with a bit of maple syrup over it. This entry was posted in Fruit, Gardening, Planning, Vegetables and tagged Ficus, fig, ginger, greenhouse, Zingiber. Bookmark the permalink. Trackbacks are closed, but you can post a comment. Do you have more pics of your greenhouse? Size? How tall is your fig tree(s)? What heater do you use? Really great post. Thank you. I’ll post more photos of the greenhouse sometime. It’s only 20 by 20 feet but, as I wrote, there’s a lot packed into it. Heat is from a Modine propane heater mounted up high. Please post pictures of your greenhouse! A ton of them! Or at least e-mail me some pictures please. Starting mine soon, would love the inspiration asap. Now I have greenhouse envy. The figs and ginger are icing on the cake. Ginger is my new middle name! I am going to try some next year in my unheated greenhouse over the summer. I would love to have a stash of pickled ginger to go with some homemade veggie sushi. Plus, I think it is a beautiful plant! Great post Lee.. your ginger surely increased more than mine. Another fabulous use of the ginger is to make ginger ale. I peel, slice and boil gently for 20 minutes or so, let cool, strain and pour an apporpriate amount into glass with ice, sweeten as desired, (I use stevia) and fill up with soda stream carbonated water. Make as strong or weak as you like. If you do not drink all quickly, freeze in ice cube trays and use it instead of ice for your drink. It is so good. I have grown ginger now for 3 years in pots but have always wished for a greenhouse for my ginger,turmeric, and lemongrass. I have successfully grated and frozen it to make tea, made ginger lemon syrup per Jeff Heriot on YouTube, and made candied ginger per David Leibowitz. All are great keepers.